Magic hour at the Eiffel tower! 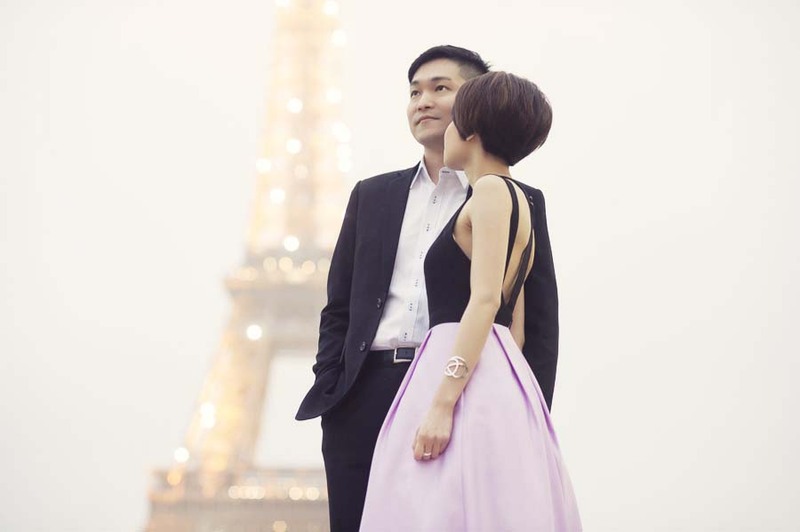 A few photographs of my couple who flew from Hong Kong for their engagement photo shoot in Paris with WeddingLight. Sharon had requested the Eiffel towerin the background with the lights on so we headed to the Trocadero square late afternoon to get the beautiful light for our portrait session. The Eiffel tower is probably the N01 destination spot in Paris, therefore always quite crowded i have to say. It is always a challenge to get gorgeous pictures there, but what our client wants, our client gets! We had one hour for our photo shoot so we decided to stay around the trocadero. Still, you quickly get into a mode where you lose track of time. We could actually have spent the whole afternoon walking around the trocadero and get beautiful shots all very different from one another. From the square itself, to the steps going down the fountain, the numerous beautiful statues that can be used as a romantic backdrop, a gorgeous Parisian garden on its side and the merry go round walking all the way down, it is a wonderland for a photo tour in Paris with your love one. One hour of photography is plenty to cover the beauty of the site indeed. Now if you want to stretch your photo session to bring back home a larger collection of photographs that shows your happiness as a couple in the city of love, there are indeed numerous beautiful backdrops. From the grand monuments, historical gardens to more typical neighborhood where you will find little cafes, cobbles tone streets, flower boutiques & bakeries that can also be used as a romantic backdrop, it is always a feast for the eyes and a lot of fun to do. I understand that you may be camera shy, specially the men actually but do not worry, as it only takes a couple of minutes for me to make sure that you are going to have a great time and relax with your photographer in Paris! This is partly what a professional photographer does … that is making sure that his clients are ready to party and have some fun! So if you are planning a trip to Paris in the next few months, it is always the perfect time for an engagement photo tour. Spring, summer, fall & winter, lights and colors may change but the city is always simply breathtaking! and it is always the perfect time for some beautiful portraits with your love one in the city of romance.